When an international collaboration of physicists came up with a result that punched a hole in Einstein's theory of special relativity and couldn't find any mistakes in their work, they asked the world to take a second look at their experiment. Responding to the call was Ramanath Cowsik, PhD, professor of physics in Arts & Sciences and director of the McDonnell Center for the Space Sciences at Washington University in St. Louis. Online and in the December 24 issue of Physical Review Letters, Cowsik and his collaborators put their finger on what appears to be an insurmountable problem with the experiment. The OPERA experiment, a collaboration between the CERN physics laboratory in Geneva, Switzerland, and the Laboratori Nazionali del Gran Sasso (LNGS) in Gran Sasso, Italy, timed particles called neutrinos traveling through Earth from the physics laboratory CERN to a detector in an underground laboratory in Gran Sasso, a distance of some 730 kilometers, or about 450 miles. OPERA reported online and in Physics Letters B in September that the neutrinos arrived at Gran Sasso some 60 nanoseconds sooner than they would have arrived if they were traveling at the speed of light in a vacuum. Neutrinos are thought to have a tiny, but nonzero, mass. According to the theory of special relativity, any particle that has mass may come close to but cannot quite reach the speed of light. So superluminal (faster than light) neutrinos should not exist. The neutrinos in the experiment were created by slamming speeding protons into a stationary target, producing a pulse of pions  unstable particles that were magnetically focused into a long tunnel where they decayed in flight into muons and neutrinos. The muons were stopped at the end of the tunnel, but the neutrinos, which slip through matter like ghosts through walls, passed through the barrier and disappeared in the direction of Gran Sasso. In their journal article, Cowsik and an international team of collaborators took a close look at the first step of this process. "We have investigated whether pion decays would produce superluminal neutrinos, assuming energy and momentum are conserved," he says. The OPERA neutrinos had energies of about 17 gigaelectron volts. "They had a lot of energy but very little mass," Cowsik says, "so they should go very fast." The question is whether they went faster than the speed of light. "We've shown in this paper that if the neutrino that comes out of a pion decay were going faster than the speed of light, the pion lifetime would get longer, and the neutrino would carry a smaller fraction of the energy shared by the neutrino and the muon," Cowsik says. "What's more," he says, "these difficulties would only increase as the pion energy increases. "So we are saying that in the present framework of physics, superluminal neutrinos would be difficult to produce," Cowsik explains. In addition, he says, there's an experimental check on this theoretical conclusion. The creation of neutrinos at CERN is duplicated naturally when cosmic rays hit Earth's atmosphere. 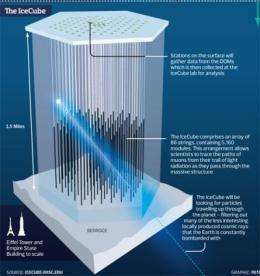 A neutrino observatory called IceCube detects these neutrinos when they collide with other particles generating muons that leave trails of light flashes as they plow into the thick, clear ice of Antarctica. "IceCube has seen neutrinos with energies 10,000 times higher than those the OPERA experiment is creating," Cowsik says.."Thus, the energies of their parent pions should be correspondingly high. Simple calculations, based on the conservation of energy and momentum, dictate that the lifetimes of those pions should be too long for them ever to decay into superluminal neutrinos. "But the observation of high-energy neutrinos by IceCube indicates that these high-energy pions do decay according to the standard ideas of physics, generating neutrinos whose speed approaches that of light but never exceeds it. Cowsik's objection to the OPERA results isn't the only one that has been raised. Physicists Andrew G. Cohen and Sheldon L. Glashow published a paper in Physical Review Letters in October showing that superluminal neutrinos would rapidly radiate energy in the form of electron-positron pairs. "We are saying that, given physics as we know it today, it should be hard to produce any neutrinos with superluminal velocities, and Cohen and Glashow are saying that even if you did, they'd quickly radiate away their energy and slow down," Cowsik says. "I have very high regard for the OPERA experimenters," Cowsik adds. "They got faster-than-light speeds when they analyzed their data in March, but they struggled for months to eliminate possible errors in their experiment before publishing it. "Not finding any mistakes," Cowsik says, "they had an ethical obligation to publish so that the community could help resolve the difficulty. That's the demanding code physicists live by," he says. Physicists: Did neutrinos break the speed of light? IceCube has seen neutrinos with energies 10,000 times higher than those the OPERA experiment is creating,..."Thus, the energies of their parent pions should be correspondingly high. The problem is, these highly energetic neutrinos may not come from pions, but from heavier and even less stable mesons. In particular, muinos should originate from kaons, because it seems rather improbable, 2nd generation of neutrinos would come from 1st generation mesons. Due their strangeness, the rest mass of kaons if at least five-times higher, than the rest mass of pions, so it's able to explain energy of muons formed comfortably. "We are saying that, given physics as we know it today, it should be hard to produce any neutrinos with superluminal velocities"
Isn't the point that if the Opera results are replicated then the 'current laws of physics' will have to rewritten to account for this ? Using existing theory to 'prove' that what is possibly new physics cannot be true because existing theory says it can't be seems pretty circular to me. the neutrinos are traveling in hyperspace for part of the journey and therefore the distance travelled is shorter. The neutrinos reach the speed of light and with a little more energy they rip through the fabric of spacetime and re-enter it closer to the target. Current theory says neutrinos cannot reach the speed of light and the that the little bit of extra energy is actually quite a lot - but thats what current theory says. Cool if it is whats happening though - experimental proof that there are more than the 3 spatial dimensions we're aware of. Quoting theory to prove or disprove another theory is always circular reasoning, which is a fallacy. Theory is an attempt to understand the Facts and make predictions thereby. Fact is what is, regardless of what the theory claims should be. therefore fact should always trump theory. One should not "re-interpret" the facts because of what an existing theory does or does not say. But theoretical physicists love their theories so much... As Einstein once said: "If the facts don't fit the theory, change the facts." For example, whole the Big Bang model has been developed to its present state as a gradual adjustment of theory to observational facts. the theory of Relativity claims a neutrino that reaches the speed of light would have infinite energy. The FACTS suggest neutrinos in fact reached or exceeded the speed of light. If the experiment can be replicated, that would mean the theory of Relativity must be revised or discarded. Mankind does not know the true laws of physics. Mankind only knows theory, which is an approximation of the true laws of physics. The general relativity is wrong in much more fundamental things, than the speed of neutrinos. For example, from GR follows, all massive objects should collapse into gravitational singularity with speed of light. We are talking together, so it's apparent, this theory fortunately doesn't work at the human observer scale. It actually works well only for the most lightweight objects, like the photons in connection of theses most massive ones. Everything else is affected with quantum mechanics too. On the other hand, quantum mechanics suffers with the same problem at the quantum scale, as it doesn't predict gravity. Instead of it it predicts, the quantum wave of every free particle should expand and evaporate into infinity. We aren't evaporated yet - so it's apparently wrong at the human observer scale as well. IMO all laws of observable reality follows from the situation, when some finite random object interacts with its random neighourhood, which is infinite. Everything is actually the geometric result of the trivial fact, we are random and smaller than the rest of Universe. We aren't required to assume any particular laws for it. But only in very limited extent, which wouldn't interfere with most of other situations. It's not matter of quality, but the quantity too. Actually, if physicists would think conceptually, they would reveal the same violation of relativity for photons already - just of the opposite sign. The photons aren't light wave, so they may not move with the same speed. If so, which way? Actually, the photons are kinda solitons (wave packets) of light waves, and all solitons are moving slower, than their parent wave (just because additional extra-dimensions are involved in their motion). So, if photons are slower than the speed of light, they violate the relativity in the same way, like the neutrinos - just in symmetric way. The photons are quantum objects, so they shouldn't exist in relativity, because the relativity doesn't support the quantization. These thingies shouldn't be here at all. Actually, the measurement of the actual speed of photons is even more difficult, than the speed of neutrinos due the decoherence, which is why the physicists didn't notify it yet. a neutrino that reaches the speed of light would have to have infinite energy acording to General Relativity.... Hence to avoid this impossible condition the neutrino must rip through space time just before reaching infinite energy and thus comply with the best theory we have available to explain it. Yes, I also wonder how they were even able to consider faster than light particles within the QFT framework. I'll have to track down the paper to see what they did exactly. Actually every quantum wave is tunnelling through space-time routinely back and forth and the low mass of neutrino just makes it more apparent during propagation at larger distances. The superluminal component of light wave spreading can be observed in surprisingly simple arrangement. My how the know everything know nothings wail at the possible demise of that which always guaranteed them jobs and tenure if they stayed religiously devout. This is why the actual revolutions usually come from outside of sectarian environment (cold fusion as an example). In Czech we have a proverb: "carps never empty their own pond". Nevertheless, the superluminal neutrinos aren't real tachyons, their violation of relativity is weak only, so they could be adopted with mainstream theories. Many of them (string theory) would expect these violations instead - it could justify the assumption of extradimensions, for example. The problem is, the superluminal speed of neutrinos violates the Lorentz symmetry, onto which the string theory is based too. Which is probably the reason, why some string theorists called the OPERA results "phantom of Opera". But IMO it's virtually impossible to prove the existence of extradimensions without violation of relativity, just because the relativity is 4D theory. This could be like a recurrence relations in mathematics. If you start with initial conditions in a specific range you will always get near a fixed point that will never be reached,the fixed point is the limit of he recurrence. With a delicate tuning of the initial conditions you might get to another limit (fixed point). There could be different maximum speeds in the universe depending on the initial mass of the particle. If the neutrino has a complex number rest mass it can pop into existence (real number mass) only at a certain speed and this can be greater than the speed of light. a neutrino that reaches the speed of light would have infinite energy if it did not rip through the specetime fabric. Spacetime is not a "fabric"... The statement "ripping through the spacetime fabric" has no defined meaning. You are confusing an analogy for a literal description, along with many other people. Particles reduce their spin as velocity increases(conservation of energy). Spin creates magnetic field that give the particles mass. Velocity of particles reduce physical mass as momentum increases. Particles with less energy have less spin to begin with. At high speed they have minimal spin. This allows them to penitrate objects more easily. If the Cern neutrinos had 10,000 times less energy than the icecube neutrinos, they may very well be capable of going faster. This is only a theory. When I refer to spin I mean rpm, not some quantum mumbo jumbo. I read your article "Good Vibrations". You claim that you are only trying to explain the principles of your theory and you tell readers to use the formulas of the current theories for actual work. I'm afraid that doesn't cut it. Anyone proposing a new theory must derive its equations of state from the fundamental postulates of their theory. Nobody will do this for you. It is the responsibility of the person proposing the theory to make the derivation public so that all may verify the validity of the mathematical statement of the fundamental postulates and verify that the derivation is free of mathematical errors. It is also necessary to demonstrate that your equations of state produce results as accurate as current theory and improve upon current theory in at least one aspect to be considered an improvement. In case you don't know, an equation of state is a formula describing the interconnection between various macroscopically measurable properties of a system. So tell us please what is it? Relativity may apply to particles but don't expect it to apply to particles which change into other particles in flight. As Einstein once said: "If the facts don't fit the theory, change the facts." Or make up a quote to fit your theory. Particles .. at high speed they have minimal spin. This allows them to penetrate objects more easily. It's correct insight, although it actually applies to the projection of spin into motion direction only. My point rather is, the particle without spin is essentially a scalar Goldstone boson, similar to gravitational wave, which can penetrate massive objects with superluminal speed in AWT. It could explain the observed dependence of the superluminal neutrino speed to the energy. In addition, the neutrino could lose its spin during parity oscillations under temporal formation of so-called sterile Majorana neutrino. Such an object would make a sudden jumps through space-time like frog, because it should move with superluminal speed during it. The existence of sterile neutrino was negative in MiniBooNE experiment, but the search is continuing. The problem is that a particles intrinsic "spin" is not due to any aspect of the particle spinning. Fortunately this semantical "problem" is not related to the superluminal neutrino speed in any aspect. The change of spin projection with speed is observational fact, which can be derived from QED quite easily. It can be modeled with Widnall's instability of vortex rings. Certainly would be tricky to measure the speed of light before the energy of the photon arrived. At the case of gamma ray photons it's possible in the same way like at the case of neutrinos - the observation of the gamma bursts of remote supernovas. The visible flash is spreading like waves preferably, the gamma ray portion of it via photons, so that the difference should be apparent. the quantum wave of every free particle should expand and evaporate into infinity. The de Broglie wavelength of a particle doesn't expand unless its momentum decreases. Good point though. Maybe the free particle gets tired and slows down and finally runs out of gas and stops. ...the observation of the gamma bursts of remote supernovas. The visible flash is spreading like waves preferably, the gamma ray portion of it via photons, so that the difference should be apparent. So the flash gets there before the photons. Interesting. More than likely it is three degrees of freedom in some higher order abstract and dimensionless field. I'm looking for something physical, not abstract and dimensionless. Why not? Be precise in your answer. I think the equations of relativity require a mass value. So if the particle changes into another particle which mass are you going to use? Maybe the free particle gets tired and slows down and finally runs out of gas and stops. But you can play with the Schrodinger equation on the applet here - it just shows, the particle at rest is unstable. It actually never happens due the presence of omnipresent Brownian noise of vacuum - but this is something, which quantum mechanics doesn't take into account in the same way, like the GR. This noise makes the deBroglie wave compact with gravity field potential. This is the basis of the approach called the double quantization, which helps the quantum field theory to give more realistic results, than the original quantum mechanics. Isn't it funny, the quantum mechanics is saved just with quantum noise? I like your terminology. Much better than quantum vacuum. Anyway what is a quantum wave a wave of? Actually at the short distances only. At the larger distances the lightweight photons manage to form a compact cluster around these heavier ones and they travel together, being hold mutually with their own gravity like solar system. This indeed fools the physicists, who are expecting the larger delay between photons of different wavelength at longer distances. The contemporary physics is rather difficult for schematically thinking theorists. the particle at rest is unstable. Therefore I guess it's not at rest. Or maybe it decays? Please explain. Certainly fools me. Guess you must be smarter than those dumb physicists. Especially the schematically thinking theorists. Anyway what is a quantum wave a wave of? Like I said, this is a pure QM solution - it's apparently unphysical, as it doesn't take the account into background noise field, which wobbles the center of mass of particles all the time, so they cannot stay at rest - so they're actually a much more stable, than the QM predicts. The same effect of background quantum field - just reversed one - applies to general relativity: it prohibits the gravitational collapse of large massive bodies in the same way, like it generates the gravity field stabilizing these small ones. It's apparently just the matter of scale, which distinguishes gravity from pressure of radiation. ..you must be smarter than those dumb physicists. Especially the schematically thinking theorists. Nope, I'm just using the nonformal way of thinking in the same way, like they're using this formal one. These two ways of thinking are symmetric and complementary. I'm thinking in perspective of longitudinal waves and I don't care about details of formal theories, whereas the mainstream physicists are trained in thinking from deterministic perspective mediated with transverse waves, the waves of light in particular and they don't care about underlying qualitative logics of their theories. Whole the mainstream physics is oriented to formal approach and Lorentz symmetry, which is why it can be expanded rather easily with dual way of thinking. My advantage is, this way of thinking can be shared with laymans more easily. The normal people don't want to compute anything, they just want to understand, what the physicists are computing and the physicists have no way, how to explain it. A collective wave of many other waves. So the answer is a collection of many other answers. Guess I'm lost. Interesting discussion about quantum foam, bubbles, rotators and charge carrier stripes. Maybe somehow they could be related to the question but who knows? Nope, I'm just using the nonformal way of thinking in the same way, like they're using this formal one. No problem as long as you don't try to correlate your nonformal way of thinking with anything real. It's all closely related to dense aether theory. If we condense some dense gas like the supercritical fluid, an interesting system of nested density fluctuations is formed. In this hyperdimensional phase every density fluctuation is composed of many smaller ones. It's just matter of density of the gas, which limits the number of nested generations, so I presume it's infinite. It enables to form the nested foam of vacuum fluctuations and we are living at one layer of it. No problem as long as you don't try to correlate your nonformal way of thinking to anything real. The highly formal approaches (like the string theory) face the same problem. They describes many real life phenomena, but the string theorists cannot prove it in formal way. Often they're not even recognizing it. So the answer is a collection of many other answers. Dense aether theory is implicit theory. It doesn't explain, what the space and time actually is - it explains them with many nested spacetimes (which cannot be seen). The question is, whether the explicit approach isn't overly antropocentric. Why the Universe should be finite and explicit? The assumption of such limits just brings more additional questions than answers and it actually doesn't explain anything. density of the gas, which limits the number of nested generations, so I presume it's infinite. Infinite density of gas? It is getting a bit stuffy in here. ...string theorists cannot prove it in formal way. Proof requires assumptions. Watch out for those assumptions. On the contrary, the infinity doesn't require neither considers further reasoning. We are just saying with it clearly: OK, the ability of theory (to predict something) ends right here. Why I should do it? It's not my theory. The string theorists ignore other theories as well (if not fight with them, like with LQG). Dense aether theory is implicit theory. It doesn't explain, what the space and time actually is - it explains them with many nested spacetimes (which cannot be seen). Imaginary explanations, in other words. Sort of like the answer is a collection of many other answers. Sort of like the answer is a collection of many other answers. Why not, if this just the way, which reflects the structure of observable reality? But my answers don't generate many OTHER answers. My answers are implicit, which means, they do require answering of just the very SAME questions for their reasoning ad infinitum. IMO at the moment when we find such a way of reasoning, we are effectively at the end of reality understanding, because we just found a tautological self-referencing TOE. We are just saying with it clearly: OK, the ability of theory (to predict something) ends right here. IMO if we find such a way of reasoning, we are effectively at the end of reality understanding. Yes, but if you create it with a v>c then you only need for it to have negative mass. Which doesn't exist. Interesting point. If the particle changes mass during flight then it might have a negative mass relative to what it had been before. @Seeker2 I'm looking for something physical, not abstract and dimensionless. Space is simply matter in another phase. Every phase of matter is a different alignment of the nucleus. In space that alignment becomes completely imaginary. @Seeker2 I like your terminology. Much better than quantum vacuum. Anyway what is a quantum wave a wave of? The most basic thing of all: vibration. Particles reduce their spin as velocity increases(conservation of energy). So like particles with spin 1/2 would reduce their spin to say 0.499? It's similar to ball floating at the water surface. The large ball floats smoothly, as the density fluctuations of water surface cannot affect its submersion. The small ball like the neutrino alternatively surfaces and submerges, which corresponds the travel along time dimension in context of AWT model of space-time because at the quantum scale the time arrow is reversible. What the neutrino does during its oscillations is the alternative evaporation and condensation. The condensation corresponds the positive mass, the evaporation corresponds the deflation with antigravity, i.e. the negative mass. This is how the quantum wave of less massive particle looks like. Every phase of matter is a different alignment of the nucleus. What if the matter doesn't have a nucleus? Vibrating waves, I guess. So vibrating waves of what? I'm talking about quantum wave, whereas you're talking about quantum wave function. This is a difference. at the quantum scale the time arrow is reversible. Yes in a way. Per Feynman time runs in forward for matter and reverse for antimatter. Current time is the current time in both forward and reverse time. The universe expands in all directions including time. So the universe is going nowhere in space or time, only expanding in both. The wave function is a fiction. If the quantum wave function wouldn't represent anything physical, we couldn't measure it. http://www.nature...120.html IMO it's real as everything else - we just cannot observe it directly because of its tachyonic/extradimensional nature. Apparently, the evolution of physics is faster, than the way of thinking of some individuals here. The fact, something is hidden beneath the water surface doesn't mean, it does not exist at all. It just means, it cannot be observed directly with surface ripples. Nope, they change the projection of their spin in particular direction, the direction of their motion. So if the projection of their spin changes along their direction of motion then their direction of motion must be changing. I see. Anyway a wave or wave function of what? Yes note a particle at rest has no wave function. Yes also I'm sort of confused about the term "quantum foam". Would it have a defined meaning? Nothing. The wave function is a fiction. I was thinking of light waves or matter waves. Maybe they're not technically quantum waves. Here's a conjecture - the Goldstone boson is actually the quintessential force, the stuff that causes spacetime expansion. so they're actually a much more stable, than the QM predicts. So QM predicts that they should be unstable? You realize a particles "spin" has nothing to do with rotation or any other kind of movement, right? ...and I accidentally rated that post a 5, don't get excited. These mainstream physicists should be introduced to QM. The normal people don't want to compute anything, they just want to understand, what the physicists are computing and the physicists have no way, how to explain it. Too bad the physicists aren't normal people. So nothing physical, only an abstraction. Hey no problem. You're probably the first. The universe is not made up of matter and vacuum, but instead is comprised of standing and traveling electromagnetic (EM) waves. A standing wave appears to have both momentum and inertia when interacting with another standing wave, thus giving us the impression of 'hard particles' hitting each other. The hard particle nature is redundant because it can always be converted to electromagnetic energy, which has no particle properties. If the particle is not part of a standing wave nucleus it must be part of a resonant system, or it will vanish. Vibration is the most fundamental thing, not matter. So it must be vibration of the most fundamental thing, whatever that is. Matter is a localized scalar wave. I understand a wave to be a disturbance in some medium. What would this medium be? FTL Turtles with 'mumbo jumbo' as a key property, vibrating in an unreal spacetime dimension and Pions that have freewill to decide if they 'want' to decay or not. Oh look up in the sky .. its Santa. I don't think "time" is physical, only a concept. Things change, ergo "time passes". Time is a concept referring to human (and other animal) perception of the changing state of reality. rofl, best post you've ever made. You got it right, apart from the preposition "of." Everything is ultimately vibration obeying a precise numerical sequence. The medium is phase waves, or pure vibrations. They travel faster than light up to infinite speed. Superpositions of these waves form packets, and sometimes particles. The stuff inside matter is scalar waves where the electro and magnetic waves cancel to zero amplitude. Scalar waves interact between nuclei. They are undetectable with western instruments. They are FTL. Traverse waves are photons which only interact with electron shells, and create your perceptible world. They cannot penetrate the Faraday cage of the atom at typical energies. Time is an effect stemming from the fact that radiant energy is always remitted at a lower energy. This creates a unidirectional arrow along which everything can be ordered. However in lasers and nonlinear materials light can step up in frequency one octave. That's why it's possible to make time-reversed light. From there it's possible to build custom standing waves as yet undiscovered in nature: A kind of holographic matter. I completely agree that there is nothing fundamental about effects like time of gravity. Indeed anti-gravity conditions occur in particle accelerators, so that the superconducting magnets must be bolted to the ground. Typical for physicists the phenomenon is ignored because it violates the standard model, which is already a leaky sieve. I'll translate the article to English. Screw the observation, our equations say it didn't happen . We don't care what you saw! I agree with indio007. The blatant circular reasoning clearly defies logic. The team requested reviews of their experiment for possible errors in procedure or method and/or errors in the observed results not judgmental supposition from theorists. As I explained to Albert, "One day people will find what I have taught you, while it is brilliant, it may not in fact, cover everything". I went on, "The theory of relativity is like automobiles, brakes, tyres and the coefficient of friction - it's fine, but when you change the tyres to bald tyres and a wet road, the theory of relativity, only needs to be added too." In summary, I said, "Albert, one day they will realise that it's only an idea - and it's OK for them to evolve and be improved upon". lol just musing here over the fact that someone here said a neutrino approaching the speed of light would have infinite energy, so then every bit of the universe could potentially have infinite energy? Thus the big bang, or big barf, whichever you prefer calling it, makes plenty of sense. infinite energy spewed out of one particle, a super-massive singularity so big it could have been smaller than a quark. You did say infinite energy, so cmon man if that's the case then why not? Certainly if there is nothing to travel through at the speed of light, not even vacuum energy (which caps speed in the universe and determines the speed of light), you are travelling nowhere and therefore there really isn't much other object that could exist. It explains a whole lot, what are you suggesting that is better? it must be vibration of the most fundamental thing, whatever that is. You should always have some field of material to vibrate. The best explanation of it is that the Universe is random material stuff ad infinitum. Why it should have some limit in something? It would just bring the question about that limit. So what would this wavelength be? You should always have some field of material to vibrate. There ya go. Vibrating fields of material. Or is it some field of vibrating material? The best explanation of it is that the Universe is random material stuff ad infinitum. Why it should have some limit in something? It would just bring the question about that limit. So an infinitely expanding universe expanding for an infinite time. That would make it infinitely small in the beginning. But wait. That would be like a limit, wouldn't it? So actually there was no beginning. No big bang or whatever. Maybe you just wave your magic wand. Indeed anti-gravity conditions occur in particle accelerators, so that the superconducting magnets must be bolted to the ground. Typical for physicists the phenomenon is ignored because it violates the standard model, which is already a leaky sieve. What does gravity have to do with the standard model? ...the Universe is random material stuff ad infinitum. Why it should have some limit in something? It would just bring the question about that limit. So also the infinitely random material stuff would be vibrating at an infinitely high frequency I guess. Codewarrier: "Anyone proposing a new theory must derive its equations of state from the fundamental postulates of their theory. Nobody will do this for you. It is the responsibility of the person proposing the theory to make the derivation public so that all may verify the validity of the mathematical statement of the fundamental postulates and verify that the derivation is free of mathematical errors." That's quite a theory about how to create theories. Where's your math to back it up? Clearly you don't know the difference between a theory and a standard of acceptance. Well, suppose you're facing a pile of mutually inconsistent and incomprehensible theories leading into landscape of solutions and you have the simple single paradigm, which is based on robust logics and leads into robust testable predictions and it fits all these theories at the logical level, then you'll probably need any math model for acceptation of such a theory. The question is, why to refuse elegant idea which can be understood easily and it really helps to find the best formal model from the pile of equations? With increasing of the volume of information and the number of theories the criterions for their acceptation simply may change in the same way, like the character of ripples at the water surface is changing at distance. It's the same evolution like in programming of computers: the first programmers were required to know, how to program in assembly language at the strictly deterministic level. Now the programmers are required to handle visual programming environment. Were that true, particle physics would be an infinite regression with higher energies. But the human cognitive bias of "stuff" is based upon our senses employing the electromagnetic spectrum. From photon/electron interactions all our material/chemical world emerges. However this is not a fundamental thing in physics. Scalar waves travel FTL between atomic nuclei, never interacting with electron shells. A scalar being would see the world in a very, very different way. There would be no time only change and transmutation. Our concept of "stuff" would be alien to it. Materiality is an effect, and it breaks down below the atomic level, below which is only the only constant in the universe: vibration and change. Some say it is spin. What are you talking about Callippo? It sounds very interesting! That, amigo, is exactly the right question. Why are experiments with the standard model producing anti-gravity effects? Something completely unexpected is happening. That's the most exciting time in science. That's where a technician leaves off, and a real physicist begins. Sorry my quoting brok down in my last post. My writing started after "It would just bring the question about that limit"
Were that true, particle physics would be an infinite regression with higher energies. Nope, we cannot see the more distant/dense universe like we cannot see the remote landscape under the fog. So that the energy density scale of visible Universe will be always limited for us, limited human observers. Which is why we can talk about limited age of observable universe, for example. It sounds very AWTeric... My intention is just to propose the least common denominator of all possible ideas, which everyone could agree with without reference to any religion and redundant postulates. Why are experiments with the standard model producing anti-gravity effects? What are you talking about exactly? Which experiments do you mean? Whilst it is an interesting academic exercise to postulate the possibility or impossibility of the OPERA experiment results it would be far more worthwhile for them to attempt to duplicate the OPERA experiment and to then assess their actual results.The history of physics is littered with established beliefs being turned on their head as better understandings evolve. So cut the waffle and let us see what attempts at duplicating the experiment produce. The question is, why to refuse elegant idea which can be understood easily and it really helps to find the best formal model from the pile of equations? Because the elegant idea may not translate into equations of state that can recreate known observational data. On the other hand, the elegant idea may produce a set of possible mathematical formulations many of which can recreate observational data but none of which can be singled out as the correct formulation. In either case, the elegant idea fails to really explain anything. String theory is elegant and simple in principle. It is also an example of the latter type of theory. If the idea of vibrating strings was not expressed mathematically then the multitude of possible formulations would not have been discovered. Words alone were not sufficient. Aether Wave Theory is very likely to run into the same kinds of problems as String Theory when subjected to rigorous mathematical analysis. Words alone are not good enough. Because the elegant idea may not translate into equations of state that can recreate known observational data. Not all known observational data can be expressed with equations. Mainstream physics tends to ignore whole range of evidence, which cannot be subject of formal regression, yet can be used for confirmation of theory. Simple theories have simple formulation, these elegant the more. Actually only few people do understand the string theory at its nonformal, physical level (I mean me... and I can't imagine nobody else).. It's apparently problem of mathematical analysis after then, not the "words". String theory doesn't use "words". Simple theories have simple formulation, these elegant the more. That's not even remotely true - unless you gloss over the inconvenient math problems with words. AWT claims that exactly the right traveling waves are needed at exactly the right time at a point in space to create the electron's standing wave, but after that any old aether wave will keep it going. How is this possible you ask? Why the The lens effect of course. The lens effect is always exactly what is required to modify any traveling aether wave so that it will amplify the standing waves of electrons in just the right way to keep them waving forever without distortion. Sorry, I seem to have spilled a little bit of inconvenient on your lapel. Actually only few people do understand the string theory at its nonformal, physical level (I mean me... and I can't imagine nobody else).. Such statements are typical for those claiming special knowledge of the secrets of the universe. We are all too dumb to understand. Such statements are typical for those claiming special knowledge of the secrets of the universe. String theory is the product of people, not the secret of Universe. It has its strong and weak points and it can be understood at the qualitative level. This is your theory about AWT. Do you know, what this theory is actually about? It says, the observable Universe is composed of nested density fluctuations of dense particle gas. It doesn't use any other postulates and assumptions, about electrons the less. @Calippo, the sites on AWT that I have found have all different kinds of versions, so I chose one that seemed to be in line with what you have been saying. Please provide a link to the version to which you subscribe. In the comment section: people who read wikipedia and think they're smarter than the guys with PhD's in high energy physics. I don't think I'm smarter - I think, I'm right. The later is much more difficult to disprove, than the former. Callippo, I have read more than 20 of your articles. If I understand correctly, "Transverse" waves are those that exist in our observable dimensions of space and "Longitudinal" waves are those that exist in higher dimensions that we can't observe. Chaotic random nested density fluctuations give rise to these waves. It doesn't really matter. The problem is that you can always claim that exactly the right combination of density fluctuations gives rise to exactly the right transverse and longitudinal waves that explain any observation without ever having to demonstrate an exact geometric arrangement of such fluctuations or the exact gradients that exist among them to explain even 1 specific observation. Nor do you ever characterize the exact properties of the aether that govern wave propagation. Consequently I gain no intuitive feel for the behavior of the system. You may be right, but without specifics, I am forced to take it on faith. Unfortunately, faith is not science. Words alone are not good enough. Words can always be used to describe the math process. Math has symbols as a shortcut to descriptions with words that convey definition. Thank you captain obvious, other than the fact that you completely missed the point, you are spot on. On the other hand, if you did get the point, then your contribution to the thread was redundant and uninspired. Keep trying though, maybe someday you will make a relevant post. These waves aren't unobservable - or I wouldn't talk about it at all. They're not just another "parallel Universe", which cannot be seen by its very definition. These waves manifests with CMBR and quantum noise and with many other, less or more subtle effects (like so called the scalar waves in electromagnetic, for example). They're just indeterministic from 3D perspective and more subtle, than the light - but their net effect can significantly affect the observable reality. We can call the future physics the scalar wave physics. BTW There exists a smooth transition between transverse waves and longitudinal waves at the water surface and I presume, such a transition exist in microwave spectrum too. For example the well known EM-drive is a scalar wave device actually: it uses a longitudinal wave effect during generation of transverse waves. ..the right combination of density fluctuations gives rise to exactly the right transverse and longitudinal waves that explain any observation without ever having to demonstrate an exact geometric arrangement of such fluctuations..
Nope, there are quantitative effects, which require quantitative description, like the boiling point of watter. And there are qualitative effects, which require qualitative reasoning, based on geometry. For example, Galileo didn't disprove the geocentric model of Ptolemy with some complicated calculations at all. He just pointed out, at the case of geocentric model the order of Venus phases cannot appears in the way, which we are observing it. Such a dual philosophy is actually a consequence of dense aether model too. The qualitative and quantitative way of thinking are complementary and they substitute each other. Each of them has it's own application scope, which overlap mutually, but at their extreme cases are mutually exclusive. The common point of qualitative effects is, they're quite difficult to formalize. It's quite difficult to express insight of Galileo about Venus phases with formal math equations (at least I don't know about its mathematical formulation). The another aspect of these effects is, they tend to deny these quantitative ones, which are used for their description - and vice-versa. For example, it's well known, the general relativity predicts the gravitational lensing effect of gravity field. But at the places, where this field is most pronounced, i.e. at the center of gravity lens this effect is actually zero. We can observe it only from distance, where the gravity field is zero instead. From formal logic perspective the gravity lens is hyperdimensional quantum effect which has nothing to do with intrinsic perspective of general relativity. Because in general relativity the path of light is always straight and the space-time is what is curved here. My point is, the qualitative logics can be as bullet-proof, like the quantitative logics based on comparison of values. At some cases of poorly conditioned formal models it can even bring more robust predictions and results, because many formal models can lead into the same results and without deeper insight mediated with qualitative logics it's often difficult to decide betweenthem. On the contrary, the qualitative logics is inherently fuzzy (which can be good, when certain averaging of noise is required), but it cannot replace the quantitative logics of formal model, when numerical result is required for judging between two or more qualitative predictions. Apparently these two approaches are dual and they can complement mutually like the action of transverse and longitudinal waves at the water surface and they're related with uncertainty principle. This is the high level philosophy of dense aether model. Actually the nonformal logics doesn't require words, as it can be formalized with implicate geometry. After then it becomes as rigorous and bullet proff as formal math. It's quite difficult to draw the Galileo model of Venus phases in the way, which would impeach it. The geometry is to calculus as the quantum mechanics is to general relativity or matter is to energy etc. It's because the formal math is atemporal, it doesn't recognize time concept and all equations in its derivations are valid at the same moment. Whereas the geometry is always strictly temporal, as it introduces the space concept, which has no meaning without space. This is why the string theory (which is proclamativelly based on geometry) has so little number of relevant faithful illustrations. If the physicists would draw their models in space, they would see their conceptual problems immediately. What was the point? I can only guess that you don't know and are ashamed of your ignorance cause you're not saying just blubbering. Where as I stated quite clearly that the use of words always supplants the abstraction of math. Words 1 - Math 0 .. a boring old subject for drunken math majors and dimwitted zealots. Yawn. I must beg to differ with the honorable Vendicar_Decarian: "According to the theoretical predictions of the Unified Field Theory, the Large Hadron Collider has become the model for a new form of propulsion (an anti-gravity device'). The powerful magnetic field has become so strong that it is generating a repulsive force which pushes up on the collider (in effect the magnetic coils are attempting to achieve a higher orbital state by lifting off from the ground). Shortly after the device was first powered up in 2008, it suffered a catastrophic accident. You can see clear evidence for upward momentum which damaged about one hundred magnets in the device by ripping out the floor bolts." You can recognize the crackpots easily when they violate the Occam's razor and consider less probable explanation first. The damage of LHC has its trivial explanation and it cannot serve as an evidence of some antigravity effects at all. Such effects are possible in dense aether theory, but they would require magnets in motion (gyromagnetic effect). For those interested about it: the LHC crashed because of its crippled design and poor quality control during its final montage. The connections between high power copper lines were connected with silver solder which contained bubbles and it exhibited high resistance during heavy load. So it exploded accidentally and this explosion propagated in avalanche-like way along quarter of collider ring, because of gradual quenching of superconductor magnets and explosive evaporation of liquid helium, which was used for their cooling. I rather don't understand, why the whole LHC hadn't blew in this way, but this explanation still seems completely plausible for me. The point was stated earlier in the thread than the post where you plucked your original quote. We only have 1000 characters per post so we can't keep rehashing things for the benefit of people like you who join conversations in the middle and make statements that point out commonly known things not relevant to the discussion. At that point, the context was words that lead to either inaccurate formulations or lead to sets of accurate formulations none of which can be singled out as correct. In that context your post was redundant, uninspired, and irrelevant. ...there are qualitative effects, which require qualitative reasoning, based on geometry. I would argue that geometry is just as quantitative and definitive as numbers, but that discussion will have to wait for another time. My point is, the qualitative logics can be as bullet-proof, like the quantitative logics based on comparison of values. ...many formal models can lead into the same results and without deeper insight mediated with qualitative logics it's often difficult to decide between them. I agree and that is basically the point I have been trying to make. No they cant. Words have inexact meanings subject to different interpretations. Science learned to abandon word descriptions of phenomena, which is where science diverged from philosophy and left it choking in the dust. Philosophy is a dying field because of its necessary reliance on words. Words cannot be manipulated like numbers. They cannot be used to model phenomena to any useful degree. They cannot be used to repeat experimentation which is a hallmark of science. Words have inexact meanings subject to different interpretations. For example, AWT predicts the superluminal speed of gravity waves with using of water surface analogy of space-time, where the light waves play a role of surface waves and the gravity waves play a role of underwater sound waves. This analogy is bullet proof and it doesn't enable different interpretations - until you prove the opposite. The speed of longitudinal waves is always faster, than the speed of transverse waves (which explains, why we are using the transverse waves of light for observation of Universe - the question, why light is forming transverse waves is not so trivial, as it appears). Actually, without such formulation of physical problem you even cannot start with formal derivation of the speed of gravitational waves - the intuitive, logical definition of problem alway comes first, no matter how simply it actually is. We can use such a logic for the refusal of the article problem. What we know is, the Standard Model predicts zero rest mass speed for neutrino. Therefore, if someone is trying to use Standard Model for explanation of why the neutrinos CANNOT have superluminal speed, it's apparent fallacy, because superluminal speed of neutrino implies nozero rest mass: you cannot argue the speed of neutrino with theory, which is known to failed already at the question of neutrino mass. From most experiments which we know follows, the neutrino has nonzero rest mass, or they couldn't undergo neutrino oscillations. Therefore we know for sure, the Standard Model is wrong regarding the mass of neutrino already. If you cannot handle such a high level logics, then the logics of formal math will not help you anyway. Callippo, does AWT have any predictive power? Have you predicted any physical phenomena that other, more accepted models fail to predict? Has any technology been explained or developed as a result of AWT? The Standard Model is accepted for one very simple reason. It is the most accurately predictive model ever devised. It describes almost all universal phenomena to a greater degree of accuracy than any other model. Does AWT describe in an objective manner even one phenomenon better than the Standard Model? EDIT: The speed and mass of neutrinos are not settled matters. Here is a perfect way to validate your theory. Use it to provide an accurate mass and speed for neutrinos. If you achieve a more accurate result than the Standard Model (which has yet to determine either) than your theory may carry some weight. Why are experiments with the standard model producing anti-gravity effects? Something completely unexpected is happening.That's the most exciting time in science. That's where a technician leaves off, and a real physicist begins. Well I guess I've been napping. Just what was the unexpected happening? I understand human error, but you can expect that. Otherwise do we have some new physics? Did this experiment really pay off? Words can always be used to describe the math process. For example have you ever tried using the plus sign at this site? I guess you could if you just knew how. Don't photons have zero rest mass? Indeed, for example it predicts superluminal speed of gravitational waves, which manifest itself like noise of sound waves at the water surface. It predicts the symmetry of alleged Universe expansion around CMBR wavelength scale (in radiowaves the Universe should appear collapsing), ineraction of gravity waves with superconductors, etc. The speed and mass of neutrinos are not settled matters. Here is a perfect way to validate your theory. Yes, in AWT the photons are moving like transverse wave solitons with subluminal speed, until their energy is not lower than the energy of CMBR photons and the neutrinos should move like longitudinal wave solitons qith superluminal speed, until their energy is not lower than the energy of CMBR photons. It's qualitative, but easily testable prediction. Standard Model converges to AWT for the low energy neutrinos. like noise of sound waves at the water surface. Actually I think what we have is a Genesis chapter 1 update. According to Cowsik . . . (Washington University) . . . there must be something wrong with the observation . . . The above statement by Dr. Ramanath Cowsik may be unwise; Science is based on observations. Professor Ramanath Cowsik is director of the McDonnell Center for the Space Sciences at Washington University in St. Louis. According to a recent news report, NASA is now giving $1.4 million to Washington University to see if silicon carbide (SiC) grains in the Murchison meteorite formed directly from debris of a supernova explosion. They most certainly did! Observations made at Washington University several years ago showed that the SiC grains formed directly from debris of the supernova that gave birth to the Solar System five billion years (5 Gyr) ago. This shows why observations determine the validity of models, instead of the reverse. yes, a supernova was almost certainly involved. our sun is not formed on pulsar core left from a supernova that is now powered by neutron repulsion with neutrom decaying into hydrogen to make up the photodphere. that is a fact you will have to admit someday oliver. why not just admit that your neutron repulsion theory is garbage and try to make an actual contribution to science before you die? It doesn't matter, if it's garbage or not. It's special theory and as such as off-topic here in the same way, like the Aquatic Ape Theory, for example. It's just a spam and it should be handled as a spam - not as a subject provoking discussion here. Everyone who is responding to spam instead of reporting it in quiet is a spammer too. And everyone who cannot understand it is as clever and regardful of others, as ommatur himself. c.) Solar neutrinos from H-fusion magically oscillate away to make observations fit the SSM model of the Sun and the AGW model of earth's climate. In dense aether theory the neutrinos are solitons of longitudinal (gravitational) waves of vacuum, similar to Falaco solitons at the water surface, whereas photons are solitons of transverse waves of light. This model has very much to say about neutrino speed in vacuum. In this model the rest mass of neutrino is energy dependent and the neutrinos will always move faster than the light, until their energy will not become lower, than the energy if CMBR photons and the experimental results fit this view rather closely. With compare to it, I don't see any way, how the neutrino repulsion could contribute into subject of article. If the ommatur would stay OT with his theories and if he would use logical reasoning instead of links to various old PDF, I'd discuss it without problem like with everyone else here. your aether wave theory posts are all spam just like olivers, what is so hard to understand about that? you spam worse than him, at least he doesnt have 5 accounts that he spams from often talking to himself like you do. If i could get rid of 1 troll on the site i tell you what, oliver would still be here spamming his neutron repulsion theory. Dont know about that! At least Callipo is funny when he goes into 'Split' personality. mode. Oliver is just boring! MarkyMark, both are better than you. You make me feel like vomiting. Such a disgustingly ignorant and narrow minded turd you are. Have you been taking lessons from jsdarkdestruction on being obnoxious? Its good to know you remain teachable. I'm the only here, who has some matter of fact comments to this article [rawa1 Dec 23, 2011], [Callippo Dec 26, 2011] and [Callippo Dec 28, 2011]. The rest is just a noise. Spacetime is not a "fabric"... So tell us please what is it? In dense aether model the space-time corresponds the stringy density fluctuations, which are forming inside of dense gases. The energy spreads inside of such system in transverse waves of light like the ripples at the water surface, the spatial dimensions correspond the directions planparralel with water surface, the time dimension is the direction perpendicular to it. So that the space-time concept is pretty much physical, I guess. Superluminal neutrinos are not an impossibility, despite this article. Superluminal neutrinos fit well the basic concepts of AWT. In AWT the neutrinos are the solitons of superluminal gravitational waves in the same way, like the photons are solitons of transverse waves of light. We cannot argue the property of neutrinos (which are massless in Standard Model) just with Standard Model. If Standard Model would be correct, we could never observe the things like the oscillations of neutrinos, for example. So if we are still observing it, it just means this model is already wrong regarding the neutrino questions. IMO Standard Model is similarly wrong, regarding the neutrino mass, like the relativity is wrong regarding the photon mass, because in AWT both these quantities are energy/wavelength dependent. The neutrino speed should be luminal for neutrinos in thermal equilibrium with CMBR photons in the same way, like the speed of CMBR photons (it's probable, at the CMBR energy density both kind of particles are actually equivalent). It means, these theories are correct just for low energy neutrinos and photons, which will be probably still source of many controversies in future, because theorists will be confused. BMW IMO the neutrino is lightest neutralino (photino) at the same moment in context of supersymmetry theory. Photons have different mass depending on their wavelength, so that their superpartners should behave in the same way. The mass of superpartners is the lower, the mass of original particles is higher and vice-versa. At the CMBR density scale the properties of both particles will be exchanged - the photons will change into fermion (tachyons) and the neutrinos will change into massive Goldstone bosons. I thought the CMBR was blackbody radiation. What is the wavelength scale of blackbody radiation? it can always be converted to electromagnetic energy, which has no particle properties. So photons have no particle properties. Also I guess matter would have no wave properties. Clever, but I would say matter/energy is actually a form (a particular configuration) of spacetime. Matter/energy is the bread, spacetime is the dough. Without dough no bread. Don't the two following quotes from the original article seem mutually exclusive, at least as they are worded? Shouldn't the neutrinos with 10k energy radiate it off also? Apparently neutrinos with energies 10,000 times higher than those (of?) the OPERA experiment do not have superluminal velocities? It's not so apparent, as the speed of neutrinos appears to increase linearly with their rest mass at low energies. http://cr4.global...EF89.jpg But before some time I realized, the antigravity of antiparticles is violated just at low energy density scales. The higher the mass of particles is than the energy of CMBR photons, the less they're behaving like the antiparticles of negative gravity. At the case of neutrinos of rest mass 1000x higher than the CMBR photons mass (0,03 eV) the CPT symmetry should be broken by 0.001%. It would correspond the fact, we cannot observe too large Lorentz symmetry breaking in our Universe and when the antiparticle becomes surrounded with its deBroglie wave (which is always massive), it's material character will prevail again. IMO the rest mass of neutrinos depends on their energy in the same way, like at the case of photons. Bellow the energy of CMBR radiation the neutrinos are moving slightly subluminal speed, whereas the photons are moving with slightly superluminal speed (which enables them to escape from black holes, for example). At the energy density of CMBR (0.03 eV) the neutrinos are indistinguishable from photons and they're both moving with luminal speed. At the higher energy density the neutrinos are behaving like weak tachyons and the photons like weakly massive particles, until their energy is not sufficient for spontaneous lepton formation from CMBR photons. Above this limit the superluminal speed of neutrinos will decrease again because of temporal formation of positron-antipositron pairs from vacuum, which are always moving with subluminal speed. We experienced similar case with gamma rays before some time. These gamma rays appear subliminal at the mild range of energies (MKN 501 gamma ray burst). The LQG theorist were quite happy with it, as they believed, it will help them to confirm their theory. It has been interpreted as a LQG theory failure and win of special relativity. But in my opinion both these observations were perfectly relevant and consistent with AWT model, just because the behavior of photons at such large energies is more complex, than contemporary theories describe.